I finally am getting the hang of this posting pictures idea on the blog. So, I wanted to share a few from our recent trip to the zoo. One of Pookie’s favorite stops is the petting zoo in the Children’s Zoo area. It is near the zoo entrance so is usually the first place we go. He has already established a routine. 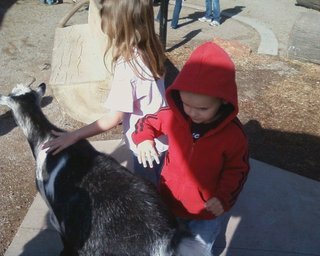 When we enter the petting zoo, he has to pet some of the goats before he will look at the other animals in that area. When we are ready to leave, he has to pet some goats again. I didn’t immediately take him back to pet some goats before leaving and he got a little upset and motioned towards them. While he doesn’t speak, he sure made his thoughts clear. Once he pet the goats a second time, he was happy to leave the petting zoo. Little Miss also loves getting a chance to pet and get close to the animals. The zoo is having an “I-Spy” event where kids have to find 4 special signs at animal enclosures. Once they find them all, they have to remember which animals were on those signs. If they report to guest relations which animals were on the signs that day, the kids win a free book. Little Miss found all 4 signs in the Children’s Zoo area. The zoo staff was really sweet and allowed Pookie to have a book also. The Lorikeets were a really fun experience. These birds drink a nectar from a tiny cup. If they see you with a cup of nectar, they will land on you. Little Miss was a bit nervous to have the birds land on her, so I held the cup. A Lorikeet quickly landed on my hand and started drinking the nectar. I slowly placed the cup on Pookie’s hand. 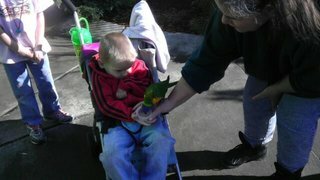 Amazingly, he held that hand very still and watched the bird. He never fussed or became frightened. Once the bird flew off, Pookie started laughing. I love these moments of sheer joy that he expresses. Even Little Miss was laughing and sharing in his joy. Before leaving the zoo, we went to the giraffe’s area. If you arrive at specified times, you can help feed them. That day, a male, his mate, and their young male were all very interested in the romaine lettuce we were given to feed them. I held Pookie since he was too little to reach the giraffe, not to mention I was really pushing a boundry in having him so close to a very large animal. It was so cute. As I aided him in holding the lettuce leaves, he giggled when the giraffe reached out with it’s very long tongue to get the lettuce. When feeding the last one, the giraffe’s lips gently brushed Pookie’s fingers and really got him laughing. I think this will end up being a regular event when we go in the future. I love this picture of Little Miss feeding the large male giraffe. She was a bit timid but had a load of fun feeding him. Just look at the size of him! His head is almost as big as she is. LOL After going to the zoo and learning that they take donations of pumpkins in the autumn to feed the animals, Little Miss is determined to grow a nice pumpkin patch just to have a load of them to take to the zoo. Knowing her, she will do it too! We already have the seeds. We will be planting the seeds into little plant pots to give them a start before putting them into the garden. Looks like there may be no problem with surplus pumpkins if her plants do well. I purchased this book from Amazon. It is a full season of pumpkin related activities and lessons. It begins with choosing seeds & preparing the garden area all the way until enjoying the harvest. 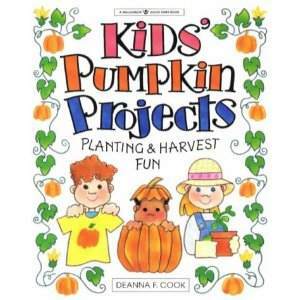 Little Miss will be using this book throughout the growing season as she grows her pumpkin patch. It will bring another level of experiences into the project. There are lessons in the book including one about the pumpkin family tree, arts & crafts projects, garden projects, and recipes. She is really excited to get started on it. We can hardly wait until our next trip to the zoo. We are planning to go at least once a month. Watching the kids as they are so enthralled by the animals is like seeing nature for the first time all over again.